This video shows aerial views of the Louisiana coast shortly after the Deepwater Horizon oil spill. An academic analysis published by the National Academy of Engineering on May 30, 2012. This video focuses on creating barriers against oil slicks from the 2010 Deepwater Horizon oil spill. A podcast published by Steven Cherry from the IEEE Spectrum on January 17, 2011. This video discusses the biggest oil spill in history. 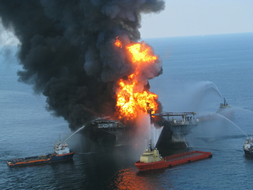 This is footage of a press conference hosted by BP's then-CEO, Tony Hayward, in regards to the clean-up efforts following the 2010 Deepwater Horizon oil spill. BP's stock price fell sharply in the aftermath of the Deepwater Horizon oil spill, leading company managers to cut back significantly on dividend payouts. BP's business ventures in Russia have also stalled since the disaster. In this video, President Barack Obama makes remarks regarding the capping of the Deepwater Horizon well, which had leaked millions of gallons of oil into the Gulf of Mexico. A newspaper article published by Ben Casselman and Russell Gold on May 27, 2010 from the Wall Street Journal. A video of an investigation report published by BP was uploaded to youtube on September 8, 2010.